In the Coptic Orthodox tradition, today begins two weeks of fasting from animal products in honor of the Virgin Mary. During our six years in Egypt we have attended the Orthodox Church regularly, appreciating without fully accepting many of their traditions. But today a small part of the mass, seemingly special for this fasting period, unnerved me. Oh Lord, grant us the forgiveness of our sins. Because you have come and saved us. I was raised a good Protestant, and imagine I still am. Our attendance at the Orthodox Church is to learn, and to the degree possible, serve – seeking to honor the body of Christ in the widest possible ecumenical spirit. Our priests share this spirit and welcome us, but are bound by the teachings of their church that bars communion to all who are not baptized Orthodox. They would be happy to re-baptize us, but to us this does not seem right. ‘There is one faith, one hope, one baptism,’ it is written, and we do not share their understanding of history lending them status as the one church which has carried Jesus’ teachings correctly. But we do share, we believe, membership in the universal church of those who trust in Christ for their salvation. Though our fellowship with the Orthodox is not complete, we trust it is real. This puts us in the position of engaging their traditions. One of the more Protestant-offending is the intercession of the saints; chief among them, the Virgin Mary. The hymn above, so beautifully chanted each week, is perfectly Protestant in every line but the first. But there is a logic behind the concept of intercession that I find able to accept, if not practice. It is a logic most practicing Protestants frequently assume. That is: In times of need, I am very eager to ask my friends to pray for me. If I believe that the prayers of a living Christian can make a difference with God, why should I not also seek the prayers of still-living Christians in heaven? Fair enough, but the Orthodox extend the logic further along family lines. Would not Jesus be even more inclined to answer the request of his mother? After all, they say, at the wedding feast in Cana of Galilee, Jesus was approached, by Mary among others, to tend to the embarrassment of running out of wine. ‘My time has not yet come,’ said Jesus, seemingly rebuffing the request. But it made no difference to her. ‘Do whatever he tells you,’ his mother told the servants. And thus, Jesus’ first miracle – perhaps against his inclinations – turned water into wine. Why should the Christian not continue to seek such obvious intercessory power? My conclusion has been: Intercession is not necessary, though it may be benign. Perhaps it even helps, if only in strengthening bonds with the church both here and hereafter. But if I seek intercession doubting that God cares enough to hear me on my own, it may become dangerous. This is not the Orthodox understanding, but I have seen this spirit in many otherwise faithful, believing friends. It is dangerous also as a manipulative technique, very akin to the Middle Eastern mindset – not far from any human – that seeks to get around the system through ‘wasta’, a powerfully placed ally who can bend rules or gain a hearing on my behalf. But if intercession seeks to engage the ‘great cloud of witnesses’, and still ‘fix our eyes on Jesus’, why not? After around six years of fellowship, this is where I have more or less comfortably settled with the Orthodox. Our Lady, the Mother of God. I wasn’t sure what dalla meant, but it didn’t sound good. The dictionary gives these options, among others: audacity, boldness. In the teachings above, Christians are told to approach the throne in this manner. But the dictionary also offered these options: familiarity, chumminess. This is the sense my friends offered after mass. They described dalla as something like ‘warm, friendly feelings’, and who could have more of this with God than the Virgin Mary? They used justification similar to that offered above, which seems perfectly logical. But that is not what the hymn is saying. It is that our dalla with God comes only through her intercession. This is making it a necessity. My friends assured me this also is Orthodox teaching. The church, they said, wants to impress upon the faithful the need for humility, while lifting up those whose previous testimonies – the saints – have stood the test of time. But yes, they assured, it is only Christ that gives us access to God. We can go to him on our own. But of Mary they may have a leg up on Protestants. ‘All generations will call me blessed,’ she said. Invoking her intercession is not necessarily fulfillment, but remembering and praising her certainly is. The Catholic Church, they said, can sometimes go too far on Mary. But the Orthodox try to keep a middle way, a balance. Today for dinner we ate rice, peas, and zucchini. Visiting Orthodox friends later on, we had cake specially made without eggs and butter. We are not fasting, but our fare was suitable for the day. I am glad it was so. Hail Mary, full of grace … with reticence still for the ending. Orthodox readers are invited to answer more fully than my laymen friends. Protestants, too. ‘The issue for me comes back to Biblical authority. 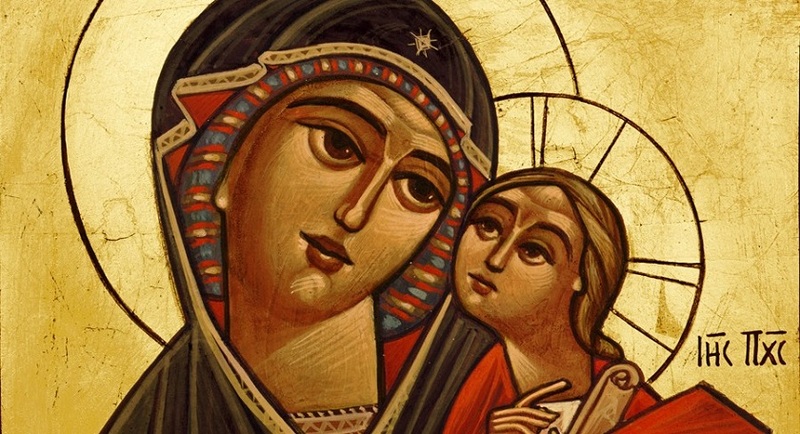 Where in the Bible can this exalted place for Mary be justified? The Bible teaches we ought to approach the Lord Jesus directly and with confidence, and insists there is only one mediator. There are no examples of intercessions by the saints.